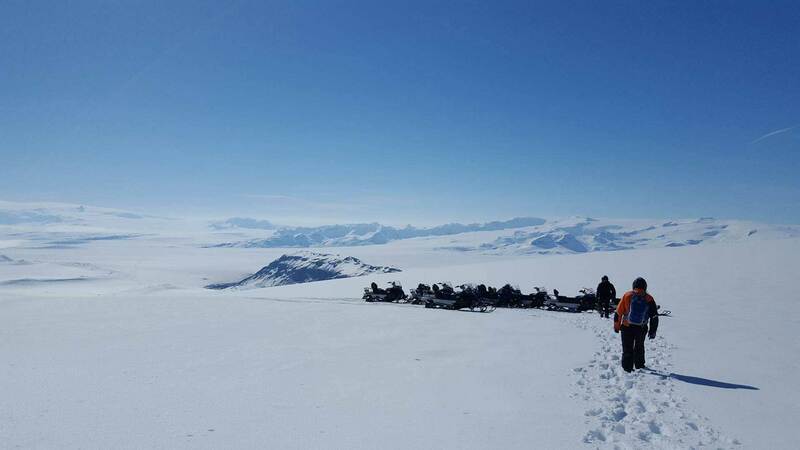 Arctic Adventures offers snowmobiling adventure tours on the amazing Langjökull glacier! We have everything from an express glacier ride tours to multiday snowmobiling & glacier expeditions! Our outstanding day tours are operated every day, all year round with a minimum of 2 passengers. Spellbinding snowmobile glacier tour on Vatnajökull, the largest glacier in Europe. Experience spine-tingling action and incredible icecap vistas! An exciting adventure on the World-Famous Eyjafjallajokull Volcano Glacier - An experience of a lifetime! Iceland is the perfect holiday destination for adrenaline hunters from all over the world. The options are unlimited to have extreme fun. Between diving between two tectonic plates, climbing huge glaciers and riding an All Terrain Vehicle, Iceland is far from being boring so that everyone can find what they are looking for. For ultimate thrills, riding a snowmobile on top of the biggest glaciers in Europe is definitely a must do! Sounds extreme, doesn’t it? Snowmobiling in Iceland is such an unforgettable adventure! Driving on top of a glacier, surrounded only by mountains and snow, is certainly something no one can never forget about. The fierce and vigorous snowmobile will take its passengers up to the clouds. Icelandic snowmobiles can go up to 70 kilometers per hour, it is said that they are more powerful than in other countries. So, one advice is not to pull the throttle too hard or you will end up on the ground! Eleven percent of Iceland’s territory is made of glaciers, which are covered in snow for the biggest part of the year. We offer snowmobiling tours on both East and West sides of the country, on Vatnajökull and Langjökull. Those two glaciers are the biggest in all Europe and both are true gems. There is no better way to see Iceland than on the back of a snowmobile for those who like adventure travels. The beautiful landscapes and the quiet environment of the glaciers cannot be enjoyed better than when riding a snowmobile. The vast plains of ice and snow are the perfect playground for outdoor enthusiasts. Adventure seekers will definitely enjoy the ride of their life! Our snowmobiling tours are really varied. There is the possibility to ride one of our snowmobiles as part of a day tour. This is a good choice to mix incredible landscapes with amazing sensations. For example, the Golden Circle can be done with a snowmobiling tour, as one of our two base camps is located in this area. 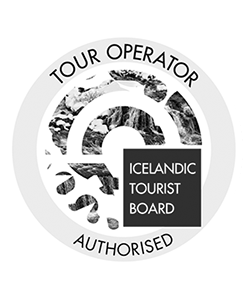 This tour is ideal to bring together all the best locations of the Golden Circle such as Geysir, Gullfoss, þingellir National Park and other amazing places. Joining a snowmobile only tour is also possible. This kind of tour is available all year long so that everyone can enjoy it, whether they are traveling during winter or summer. 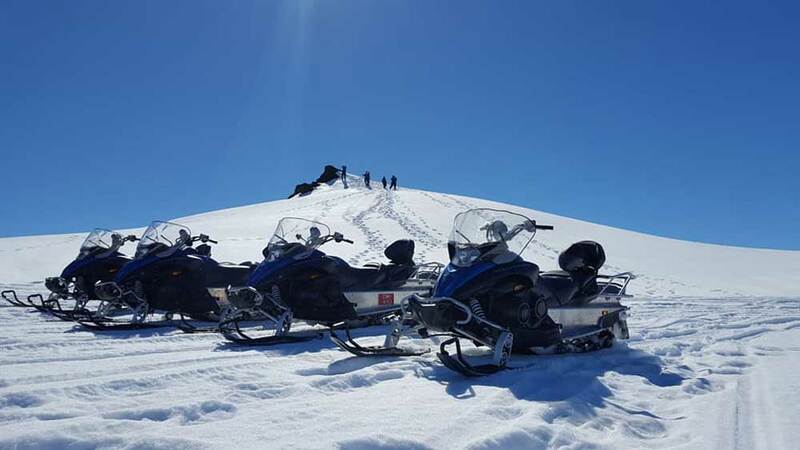 The best snowmobiling tour that we can provide to our customers is the combo with a visit to an incredible natural ice cave discovered in Langjokull glacier. This is a truly magical experience! Every participant can witness the power of nature and what it can create itself. This tour is only available from November until June as the ice cave is melting when the temperatures are too high. All of our snowmobiling tours are available for everyone above 8 years old. Children can be passengers while only adults over 18 years old with a valid driving license are allowed to drive. There are no best season to go snowmobiling in Iceland. During summer, the temperatures are nicer and the days are longer. Around June, tourists can enjoy the midnight sun, which gives them more time to explore. However, during the wintertime, a snowmobiling tour can be combined with Northern lights. This is a really strong point about the cold season. To begin with, there are several options to go to the base camps in Langjökull and Vatnajökull. 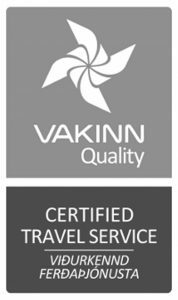 Our friendly guide can pick up the participants from Reykjavik near from their hotels with a minibus, or our customers also have the possibility to drive there if they want to meet on location (the exact meeting locations are available on the tour pages). The last and very practical choice is to meet at Gullfoss cafe, a strategic point as it is right beside the beautiful Gullfoss waterfall. Once at Gullfoss cafe, a massive Superjeep will take the participants to the basecamp in Langjökull. Getting into a Super Jeep is a unique experience. These impressive engines with huge wheels can be driven anywhere and take any road. Driving to the snowmobiling base camp is impossible for regular cars for the biggest part of the year. The base camp is about 40 minutes away from the cafe. There, all the necessary equipment will be given such as hoods, helmets, glasses, suits and gloves. The snowmobiles will wait outside for someone to ride them, but safety first! An experienced guide will tell everyone the instructions to have fun while staying safe. Adventure awaits! Now that the rules have clearly been set, the fun can begin. Riding a snowmobile in the middle of a glacier is a breathtaking experience. The nature is so pure and untouched. Zooming on fresh snow at high speed can be scary, but fear not! The secret not to fall is to believe in the driver. After one hour driving in this white scenery, the trip is over and some hot drinks and cookies will be offered. Now is time to go back to the Super Jeep for the return, and to head home. Snowmobiles were created by the French-Canadian inventor Joseph-Armand Bombardier. He was living in the remote town of Valcourt, in Quebec, in the beginning of the 19th century. As you can imagine, at that time it was not easy to go from one point to another in this kind of wintery landscape. That is why Mister Bombardier wanted to do something about it and make thousands of lives easier. What made the inventor really want to create what will become later a snowmobile was his own son’s death. During the winter of 1934, his two-year-old son’s appendix burst. The couple did not manage to take him to the hospital on time and he unfortunately died. Devastated by his loss, Bombardier wanted to prevent this to happen to other families and got back to work. And here we are! In the 30s, the first sold snowmobiles were closer to steam locomotives that the current sleek ones we are used to nowadays, 7 people could go into it. Later on, Bombardier’s technology helped during World War II. In 1958, the famous Ski-Dog (named “Ski-Doo” because of a printer error) was in the business. It was a two-person snowmobile meant to replace the sled dogs on which wintertime hunters have relied on for centuries. Nowadays, snowmobiles are more of an extreme sport than an extreme need, as infrastructures are developing around the world. However, it is still a great invention that can save the lives of people living in remote snowy places. Now, tourists can enjoy the evolution of this creation and professional riders compete in the world be the best snowmobiler. Bombardier died at the age of 56, in February of 1964. He wouldn’t live to see the success and the progress that have been made on his prototypes, but thanks to him, a great sport and leisure was created. 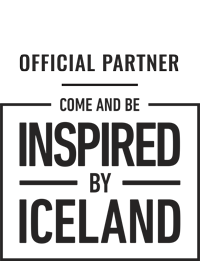 Our team has years of experience in guiding and snowmobiling in this area. The goal here is to provide safe and entertaining tours, zooming on glaciers. Our staff will take good care of everyone while all they have to do is having fun. The only requisite to drive a snowmobile is a valid driver’s licence and to be over 18 years old. Novices can relax, no previous experience is required to do this kind of tour. Of course, everybody needs to be sober and totally responsible for their own actions. It is really important to follow the rules that were given before the departure. Among them, it is primordial to do a single line behind the guide, or differ between Mario Kart and the reality. The safety equipment is provided: overalls, gloves, helmets and glasses. The overalls are usually polyester onesies and the gloves are highly recommended, even if someone has his own gloves. There is also the possibility to wear overshoes for those who forgot their hiking boots at home. Of course, each person has to dress according to the weather despite the overall. Dressing in layers is really important to keep warm. Visitors should absolutely bring warm clothing, good hiking shoes, some lunch and for sure their camera. Naturally, pictures can only be taken when off the snowmobile. Plus, all the snowmobiles have a really practical system allowing to heat the handles so that the hands don’t freeze. Vatnajökull is the largest glacier in Europe, covering 8% of the whole Iceland’s landmass. It is the main landmark of the big Vatnajökull National Park, created in 2008. This national park is the biggest in Iceland and the second biggest in Europe, it is definitely a must visit in South West Iceland. This place is really popular for outdoor activities such as glacier hiking, boat tours on the glacier lagoon, ice caving and of course snowmobiling. The total surface area of Vatnajokull is 8,100 square kilometers (3,127 square miles). Due to climate change, this number is constantly going down, even if its recession is not as advanced as other glaciers such as Langjökull. In some parts, the glacier is up to one kilometer deep (over 3,000 feet). Still breaking the records, Vatnajökull is home to the tallest peak in Iceland beneath the ice. It is called Hvannadalshnjúkur and is 2,200 meters tall (7,218 feet). The big glacier has over 30 smaller outlet glaciers. Some of the most active volcanoes are also located in the National Park. For example, there is Bárðarbunga and Grímsvötn, which both erupted during the last decade. Geologists believe that significant volcanic activity around Vatnajökull will occur over the next half-century. Langjökull, which literally means “The Long Glacier”, is Iceland’s second largest glacier after the great Vatnajökull. It stretches over 953 square kilometers across the Highlands in West Iceland. Its ice sheet is really thick, measuring up to 500 meters at certain points. Langjokull is the most popular location for snowmobiling tours. Compared to Vatnajökull and other glaciers, Langjökull is relatively volcanically quiet, with only 32 eruptions within the last 10,000 years. The long glacier is, however, home to several ice-filled volcanic craters. Snowmobilers on Langjokull will feel really small with its huge fields of snow and the impressive ice valleys. Eiríksjökull, the largest table mountain in Iceland, is located in Langjökull. Just before every winter, our brave glacier guides begin their adventurous expeditions to look for new natural ice caves. Thanks to them, visitors from all over the world are able to explore new caves all year long. 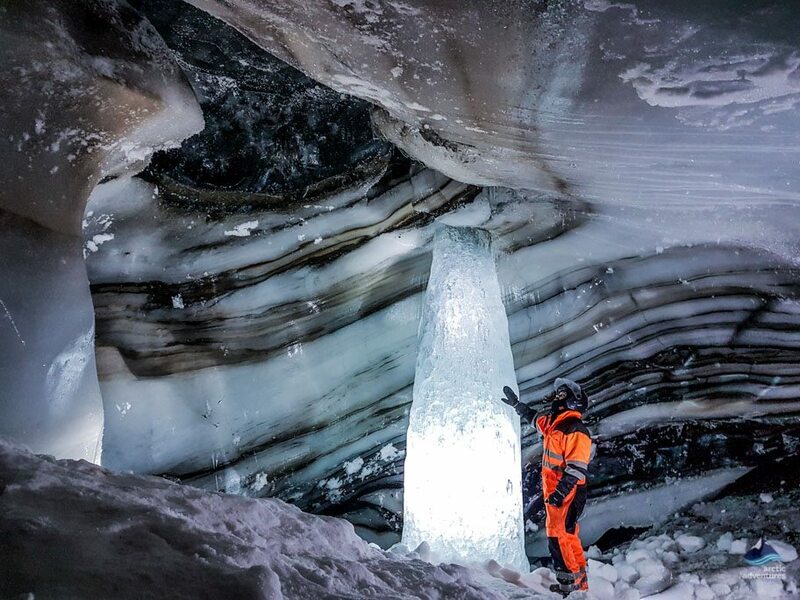 All ice caves are different from each other, and some of them are truly outstanding. This year, we found the best ice cave we ever discovered at Langjökull! On this white glacier, we found a stunning bright jewel blue ice cave. There is a brilliant blue river just on top of the ice ceiling. This magnificent crystal cave with translucent ice will make anyone feels like they are inside a blue diamond. The ice around the blue river is white with gray zebra-like stripes, which makes this place even more magical. This particular pattern is the result of various volcanic eruption through those ash layers. 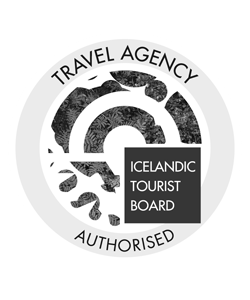 Most tourists who visit Iceland rent a car to explore the country’s many beauty spots. However, there are lots of ways to explore Iceland without the hassle of having to rent and drive a car. From snowmobiling to hiking, at sea or on land, we’ve found the best, most adrenaline-filled ways of exploring the land of ice and fire.